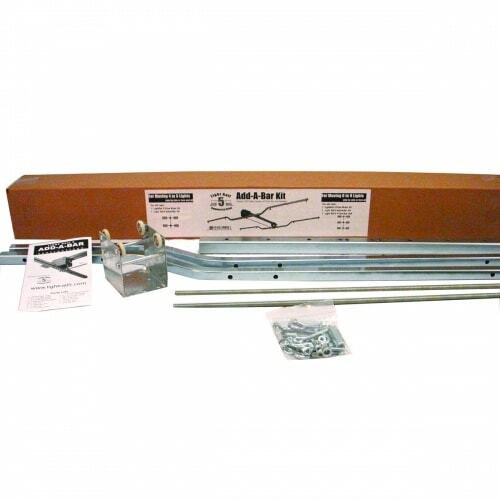 The Add-A-Bar Kit is the way to add a second crossbar to the LightRail 5.0 Kit. It includes a LightRail 5.0 Auxiliary Trolley, a crossbar, a push/pull rod, mounting hardware and instructions. The Add-A-Bar adjustable width settings are 81”, 87” or 93”. If a third crossbar is needed, you will also need to purchase a 4 foot LightRail 5.0 Auxiliary Rail. Hint: Most people have each crossbar travel in its own 4 foot Rail half section with about a 2’ gap between those 4 foot Rail sections. Light will fill in the gap area from both sides.